It is no question that the reset buttons found in the Settings.app are very dangerous for Jailbroken iOS devices. I know personally I have accidentally pressed one of the reset buttons before and this caused a lot of grief resulting in me losing content on my iPhone. If this has ever happened to you, or you would like to better protect yourself, you will be glad to know a tweak called ResetAllKiller was released into Cydia recently. 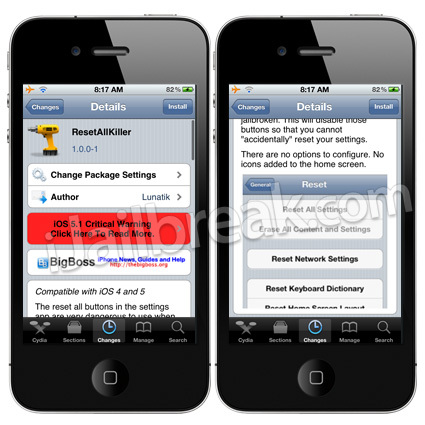 The ResetAllKiller Cydia tweak will disable the reset buttons to prevent you from accidentally clicking on them. Why is the Airplane mode on? Is it necessary? Hey jaden i recently almost had my iphone stolen, and realized that if he would have turned it off it would have been very hard for me to find it. Is there a tweak to disable the wake/home button reset and the hold wake button to slide to power off? ?